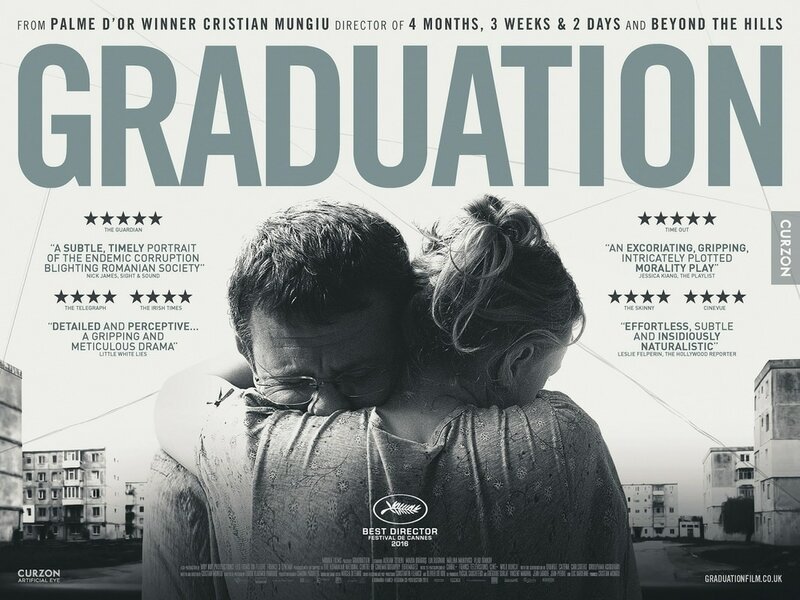 There was presumably a single, ground-zero favor done way, way back, that needed to be repaid and that ultimately led to what Cristian Mungiu‘s terrific “Graduation” convincingly portrays as the national Christmas-lights-tangle of quid-pro-quo corruption and endemic nepotism, that passes for a system of governance in modern-day Romania. Whichever Carpathian caveman it was who first borrowed his neighbor’s adze or whatever and blithely grunted “I owe you one” has an awful lot to answer for. An excoriating, gripping, intricately plotted morality play, Mungiu’s film is less linear, more circular or spiral-shaped than his previous Cannes titles (Best Actress-winning “Beyond the Hills” and Palmed’Or-winning “4 Months, 3 Weeks and 2 Days“) but it is no less rigorous and possibly even more eviscerating and critical of Romanian society, because it offers its critique across such a broad canvas. Tracing the labyrinthine messes we get ourselves into the millisecond we decide the end justifies the means, pragmatism trumps integrity, and moral relativism is preferable to moral absolutism, “Graduation” is intimate, epic and crisply intelligent: Haneke with a human touch and no desire to judge. Romeo (Adrian Titieni), a paunchy middle-aged doctor, and his frail and distant wife Magda (Lia Bugnar) have a college-age daughter Eliza (sulky Titian portrait Maria Dragus, who was one of the children in Michael Haneke‘s “The White Ribbon“) who is about to write her final school exams with the promise of a scholarship to Cambridge University if her grades hold up. But the day before the exams begin, Eliza, having been dropped off a short walk from school by Romeo who is anxious to get to his lover Sandra (Malina Manovici) for a morning roll in the hay, is attacked and assaulted. Her injuries are not serious, but her wrist is in a cast and the trauma has affected her concentration. All Romeo wants, pursuant to his near-obsession with Eliza taking the scholarship as a means of getting the hell out of Romania, is for the rules for taking the exam to be bent, or relaxed a little, in this very understandable and justified case. Failing that, he turns reluctantly to the black market favor economy that exists apparently everywhere, underneath a thin veneer of rigidly “fair-minded” propriety. If he prioritizes a certain man’s liver transplant, that man can talk to the education board member whose wife regained her job due to his efforts, and maybe he can call in a favor to make sure that Eliza gets the requisite grade. Meanwhile: the investigation into the attack is ongoing; Eliza is seeing more of motorcycle-riding boyfriend Marius; and Sandra is possibly pregnant, and needs Romeo to see about finding her own son, Mateo, a speech therapist. This all should be too much, but Mungiu’s skill is deceptive: the Romanian New Wave-approved handheld, real-location aesthetic lends an authenticity that feels raw, but the storytelling itself is silken — the director always knows which scene to play out and which to cut from, and despite the massive sprawl of plot and character, we always are exactly where we need to be. Graduation Bacalaureat Cristian-Mungiu 1And it is all men. While the beloved daughter, the washed-out wife, the patient mistress and the frail mother all make claims on Romeo’s time and care, when it comes to the business of getting things done they have at best the status of petitioners or conscientious objectors. The arcane nature of the boy’s-club system is a solid way of ensuring the continuance of male power structures and hierarchies, even in a slowly modernizing social environment, as the favor chain, where things really get done, links male doctor to policeman to male politician to male civil servant. This is a bleak view of modern-day Romania as a place where your only choice is between noble guaranteed failure and a slim shot at compromised, tainted success and where bricks come through windows for no reason. And it ends not with a bang but an ambivalent whimper, but of course that too is part of the point. As desperate as things threaten to get for Romeo, this is the drama of the ongoing: events play out, but they don’t get parceled up and delivered with a neat lesson attached — there’s no way of knowing if the moral sacrifices you made were worth it. Some time before the film ends on its deliberately anticlimactic, unresolved note, there’s an almost surreal interlude where Romeo think he spots someone involved in the attack on Eliza and gets off the bus to run after him. Soon astray in unfamiliar darkened backyards setting off a chorus of dogs, it’s as good a metaphor as any for the magnificent pessimism in “Graduation”: you make your choice and whichever way you jump, you’re down the rabbit hole, lost in the hedge maze, hunted by the barking dogs of bad decisions past.